The AMS Hydraulic High Speed 4 Stacking System is ergonomically designed to allow one operator the ability to inspect and sort 500 pallets per hour without the backbreaking job of lifting pallets. 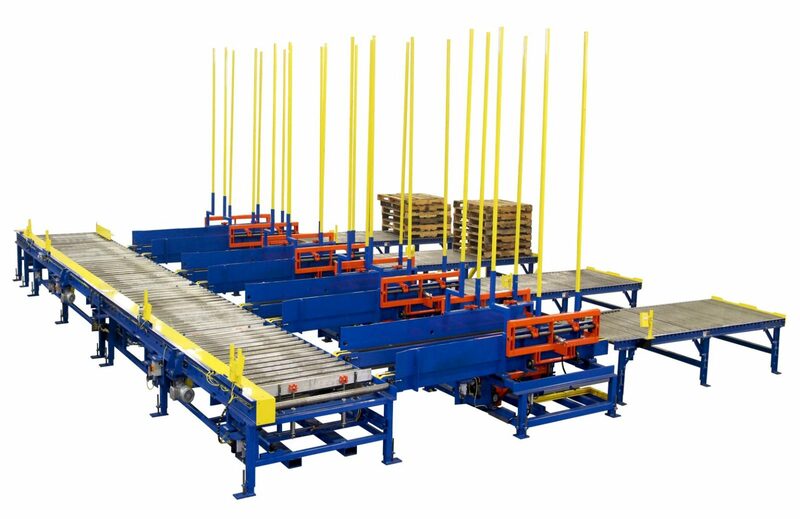 Pallets are delivered to a high speed destacker by chain driven live roller conveyor. 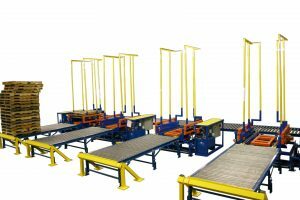 The destacker will dispense one pallet every 4.5 seconds to an inspection area. 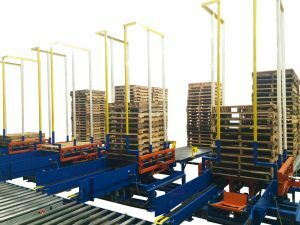 The inspection area has flipper arms that stand the pallet up for full inspection down the entire length of the stringers and deckboards. A light fence protects the operator from accidentally being struck by the flipper arm. Once the light beam has been broken, the flipper inspection arm is automatically stopped. Once inspected, the operator depresses a console button directing the pallet to the appropriate high speed stacker. Pallets accumulate in the stackers to the pre-selected stack height and then are dispensed on gravity conveyor for pickup by the fork lift driver. With the optional PalMate ERP software solution, data such as system production, size counts and grade counts can be accumulated and communicated to the general inventory management program.